The aluminum 9" / 22 cm ceramic vital frying pan by Ibili has an internal non-stick coating andit is compatible to all kind of hobs including induction. 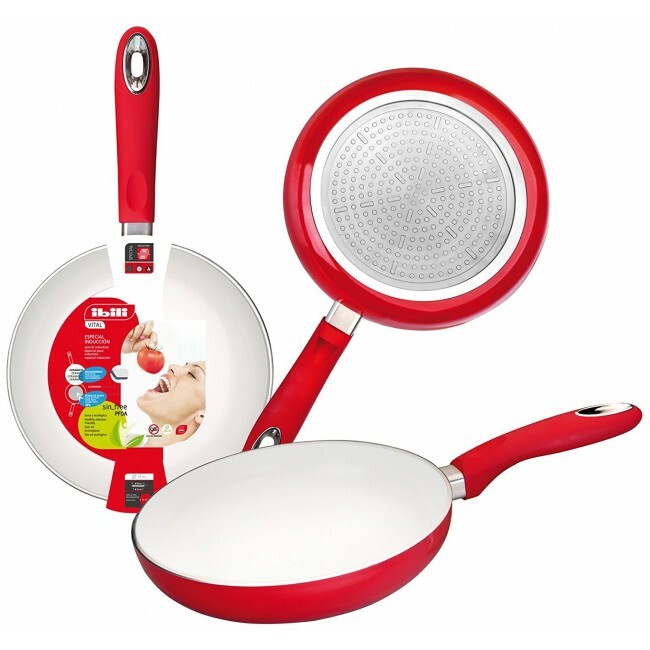 Red and white, this 9" / 22 cm Ibili frying pan is modern and attractive. This 9" / 22 cm Ibili frying pan is very practical because the food does not stick and it is very easy to clean. Use this 9" / 22 cm Ibili frying pan to prepare your daily specials. The ceramic being a high-resistant material, this one may have recurse to different ways to get cared. By example, your ceramic stoves might get cleaned in a dishwasher and so might your knives. Nonetheless, it will always be recommended to take care of your ceramic products, hand-wash, so as to guarantee the most important longevity possible. To realize this, use a neutral soap and some hot water and then, apply a sweet and dried cloth onto the surface of your product so to dry it. Sometimes, you can also use some grease on the non-stick products by using oil vegetable. What you should avoid to do : Never use neither bleach nor chlorine and wire brushes on your products made of ceramic or you will deteriorate the whole surface of your stove. Finally and if you take care of your ceramic knives, always use a wooden cutting board and not a plate or a workstation. Avoid to shock the blades by chinking them together or by dropping it accidentally. The ceramic knives can be dishwashed. To sharpen your ceramic knives, use a sharpener which fits cermaic blades and not either a traditional sharpening steel or a grinding stone.